I wanted to let everyone know that I'm going to be moving the blog over to the Penguins blog "Pensburgh", over at SB Nation. Many thanks to Paul for his years of support here. He's a good friend and a class act. Also wanted to thank all of the readers/commenters over the years (yes, that includes you "19"). You're one helluva passionate group of hockey fans. So once I get things up and running at Pensburgh, please stop by and say hello. "Damn, the Blackhawks, Sharks and Ducks sure beat us up all game long"
"Damn, the Blackhawks, Sharks and Ducks didn't barely give us any space in their zone"
"Damn, we gave up a lot of shots, while having an embarrassingly low amount of shots on goal"
"Oh yeah, that's how we keep losing in the playoffs!" Or shall I say, Penguins fans had better hope they realized that. All NHL teams get injuries. Hell, all teams get injuries. But the injuries that have befallen this season's Pittsburgh Penguins, what could already have been described as bizarre, is now getting ridiculous. This with the truly shocking news that highly touted offensive defenseman Kris Letang has suffered a mild stroke and is out of the lineup for a miniimum of six weeks while being on blood thinners. Sources have already told the Pittsburgh Tribune-Review's Rob Rossi that the Pens aren't counting on Letang returning this season, and if he indeed does return, they'll treat that as a bonus. It's a necessary evil. It's a nice problem to have. For when you employ two of the top handful of players in the NHL in Sidney Crosby and Evgeni Malkin with cap hits of $8.7 and $9.5 million (starting next season), respectively, not to mention James Neal and Paul Martin at $5 million as well, it was inevitable that the remainder of the Penguins' payroll would start to feel the effects of it. 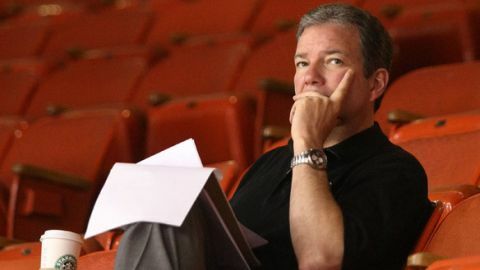 But perhaps the biggest decisions that Pens' GM Ray Shero will have to make as we get closer to the March 5th trade deadline is what to do about his defensive corps. Following up on and inspired by the charitable work of sites like Bonk's Mullet and The Production Line (with support from our SB Nation friends Winging It In Motown), which supported the Sens Foundation and the Children's Hospital of Michigan Foundation, respectively, we at Pensburgh decided to do our own type of charity donation drive. Ours will support and be donated directly to Children's Hospital of Pittsburgh Foundation. While none of his teammates were specifically mentioned during his postgame rant, make no mistake about it. He was referring to two of his teammates with among the highest salaries, center Evgeni Malkin and defenseman Kris Letang. They weren't the only ones, it was an ugly game no doubt. But after reading Scud's quotes, all I can say is one word: Bravo. The Pittsburgh Penguins have signed goaltender Jeff Zatkoff to a two-year contract extension, it was announced today by executive vice president and general manager Ray Shero. The deal begins with the 2014-15 season and runs through the 2015-16 campaign, and has an average annual value of $600,000. Zatkoff, 26, stopped 24 shots against the Minnesota Wild on Thursday night to become the first Penguins rookie goaltender to win six straight decisions since Johan Hedberg did so in 2001. The 6-foot-2, 179-pound Zatkoff has posted a 6-2 record, 2.46 goals-against average and .912 save percentage in eight games this season. He became the first Pittsburgh goaltender to notch a shutout in his first win with the team when he turned aside 19 shots in a 3-0 victory against the Columbus Blue Jackets on Nov. 2. A native of Detroit, Michigan, Zatkoff played last season for the Penguins’ top minor-league affiliate, Wilkes-Barre/Scranton of the American Hockey League (AHL). In his first year with the club, Zatkoff established career highs for games played (49), wins (26), goals-against average (1.93) and shutouts (5). He and Brad Thiessen combined to allow the fewest goals (178) in the AHL. Zatkoff was originally drafted by the Los Angeles Kings in the third round (74th overall) of the 2006 NHL Draft. He played three-plus seasons for the Kings’ minor-league team, the Manchester Monarchs, from 2009-12. In 146 career AHL games with Manchester and WBS, Zatkoff posted a 77-63-6 record, winning 20 games in three of his four full seasons. Prior to turning pro Zatkoff played three seasons of collegiate hockey at Miami of Ohio between 2005-08. He also represented Team USA at the 2007 World Junior Championship in Sweden, earning a bronze medal. NEW YORK (December 12, 2013) – The public ticket allotment to the 2014 Coors Light NHL Stadium Series™ game between the Pittsburgh Penguins and Chicago Blackhawks at Soldier Field has sold out, the National Hockey League® announced today. The tickets, which went on sale Wednesday, Dec. 11, at 10 a.m. CT, sold out in less than 24 hours. A limited number of suites are available for the event. Fans looking to reserve a suite can contact the Chicago Bears Suite Sales & Services team at suitesales@bears.nfl.net. The 2014 Coors Light NHL Stadium Series™ games begin on Jan. 25, 2014, when the Anaheim Ducks face the Los Angeles Kings in Los Angeles (9:30 p.m. ET, NBCSN/CBC). The first of two Coors Light NHL Stadium Series™ games at Yankee Stadium follows on Sunday, Jan. 26, when the New York Rangers play the New Jersey Devils (12:30 p.m. ET, NBC/CBC). The Rangers battle the New York Islanders three days later on Wednesday, Jan. 29 at Yankee Stadium (7:30 p.m. ET, NBCSN/TSN). The 2014 Coors Light NHL Stadium Series™ concludes with the game in Chicago on March 1 when the Penguins square off against the Blackhawks at Soldier Field (8 p.m. ET, NBC). The 2014 Tim Hortons NHL Heritage Classic™ wraps up this dramatic run of NHL signature events on March 2 in Vancouver, B.C., when the Vancouver Canucks host the Ottawa Senators (4 p.m. ET, CBC/NBCSN). Any remaining tickets for these events can be purchased via http://www.Ticketmaster.com/NHL and www.Ticketmaster.ca/NHL, the official ticket marketplace of the NHL. Official fan packages for all NHL signature events are available from Global Event Forum, the Official NHL® Events Fan Package Partner. For more information please visit http://www.nhl.com/fanpackages.